Members of the Story family are pictured with the sign which was unveiled on Friday during the dedication ceremony for the Steve Story Memorial Highway. Steve Story’s wife, Elizabeth Schaad, and son, Nicholas Story, unveil the sign for the Steve Story Memorial Highway. Story family friend and former Ohio Governor Nancy Hollister spoke as part of the ceremony on Friday afternoon. The signs for the Steve Story Memorial Highway were to be placed along U.S. 33 following the ceremony on Friday. DARWIN — A portion of the U.S. 33 Corridor he work diligently to have built will now bear the name of the late Steve Story. As discussed by the speakers and those in attendance for the Steve Story Memorial Highway dedication on Friday afternoon, it was the persistence of Story which played a large role in making the current U.S. 33 highway between Darwin and Athens a reality. 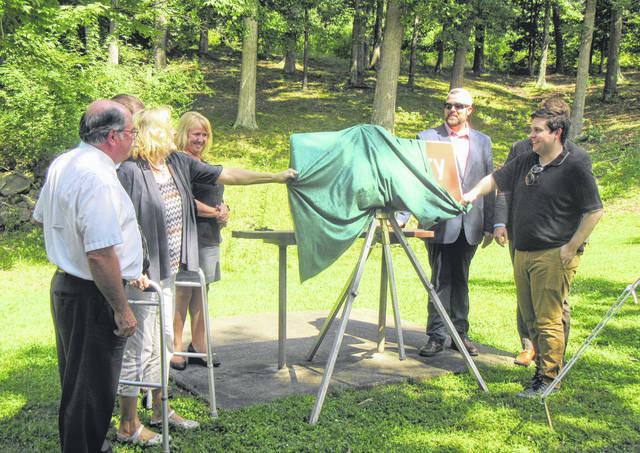 Friends and family of Story gathered at the rest area on westbound U.S. 33 near Darwin, speaking of the legacy Story left behind as a judge, advocate for his community, friend and mentor to many, and of his tireless effort for Meigs County. Story was remembered for his dedication to his community, the leadership he provided and his role as a mentor to many in the area. Commissioner Randy Smith, who emceed the event, spoke of the events leading up to the ceremony. Soon after the passing of Story, Smith said he received a message from Story’s wife Elizabeth with the idea to see if they could have the U.S. 33 Corridor named for Story. Smith explained to Elizabeth that it would take state legislation to achieve the naming, but he would reach out to State Rep. Jay Edwards with the idea. Edwards told Smith they would make it happen, adding the legislation on to a bill which was passing through the House of Representatives. The bill, with the amendment, quickly passed the Senate as well and received the signature of the governor. What typically takes a much longer period of time was achieved in just weeks, complete with the dedication ceremony and sign unveiling. Nancy Hollister, a family friend of the Storys and former Ohio Governor, thanked Edwards for his “historic efforts” to make the day’s dedication possible. Hollister stated that the dedication was important to the county, family, and all who worked with Story. Holister told of Story’s push for the U.S. 33 highway, adding that he taught her to say “33 Corridor” with a capital C.
Every time Hollister would see Story, the 33 Corridor was brought up, with Story not only saying it was needed, but providing evidence to the statement. When Hollister was in Meigs County with then Governor George Voinovich was no exception to the U.S. 33 discussion. “He taught me well about faith in his native community,” said Hollister of Story. She thanked the Story family for sharing Steve and for allowing him to leave a legacy. Story was “obnoxious,” “pushy” and “intense” about what Meigs County could be, said Hollister, showing up with boxes of factual information pertaining to the 33 Corridor to back up the need for it. Edwards noted that it is rare that there is the opportunity to name a road for “someone who made the highway happen,” but that is what was done in this case. When first becoming State Representative, Edwards said Story took him around the county, introducing him to people. “No one had anything bad to say about him,” said Edwards of Story, noting that in his positions as judge and attorney that was not an easy task. “Steve was one of my very best friends,” said Linda Warner, who spoke on behalf of the Meigs County Bar Association. Additionally, Warner called Story a mentor, and a “very challenging adversary when he needed to be” who would do so with civility. Story was active in both the local and state bar associations. Story worked tirelessly and “obnoxiously” for his community, said Warner, referencing the message of Economic Development Director Perry Varnadoe at a recent meeting to “Be Obnoxiously Proud” of Meigs County. “Believe you can and it will get done,” was the attitude displayed by Story said Paul Reed, President of the Meigs County Community Improvement Corporation (CIC). 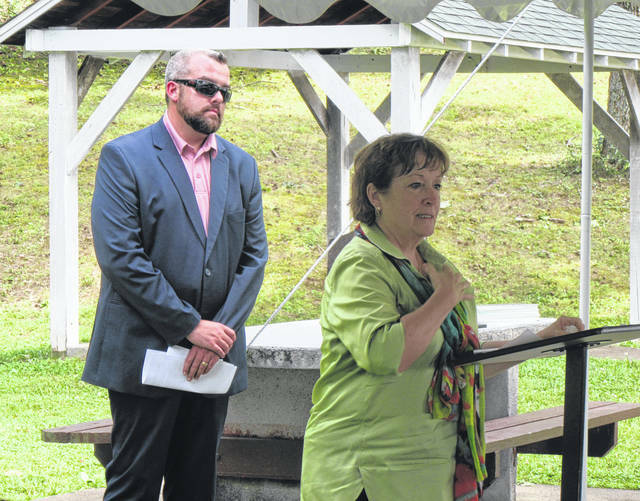 Reed recalled how Story was instrumental in starting the Meigs County Chamber of Commerce. The early needs of the Chamber which Story advocated for were money, roads and a director. Story would take Reed and go to the commissioner meetings to ask for support, receiving $25,000 to get things started. In 1995, when the CIC reorganized Story was there, continuing to serve in a leadership role as secretary for many years. “He did it because he loved Meigs County,” said Reed. U.S. 33 was not the only project in which Story played a key role. The Tuppers Plains Industrial Park would still be a corn field, said Reed, if not for the work of Story and others. “Our future is brighter because Steve Story was a part of it,” concluded Reed. “He was the ideal public servant,” read Stephens. For Story, the 33 Corridor was not about making it more convenient to get to Athens or Columbus, or shaving off a few minutes from the trip, it was about opening up Meigs County to the rest of the state, added Smith. Edwards added that it is his hope that when people, particularly young people, see the signs on the highway they ask about Story and why it is named for him. “He will always, always be remembered for how he shamelessly and obnoxiously loved his community,” said Warner. “Dreams really can come true,” said Edwards of Story’s dream for the 33 Corridor. 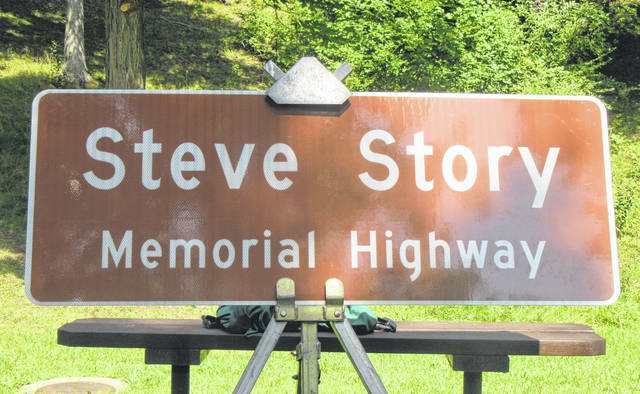 The “Steve Story Memorial Highway” signs were to be installed following the ceremony. In addition to the signs along the highway, part of the program by the Ohio Department of Transportation for the naming of highways is to present the family with replicas of the sign made of the same material. The smaller version of the signs were presented to the family at the ceremony. https://www.mydailytribune.com/wp-content/uploads/sites/42/2018/08/web1_8.5-Story-1-1.jpgMembers of the Story family are pictured with the sign which was unveiled on Friday during the dedication ceremony for the Steve Story Memorial Highway. https://www.mydailytribune.com/wp-content/uploads/sites/42/2018/08/web1_8.5-Story-2-1.jpgSteve Story’s wife, Elizabeth Schaad, and son, Nicholas Story, unveil the sign for the Steve Story Memorial Highway. https://www.mydailytribune.com/wp-content/uploads/sites/42/2018/08/web1_8.5-Story-3-1.jpgStory family friend and former Ohio Governor Nancy Hollister spoke as part of the ceremony on Friday afternoon. 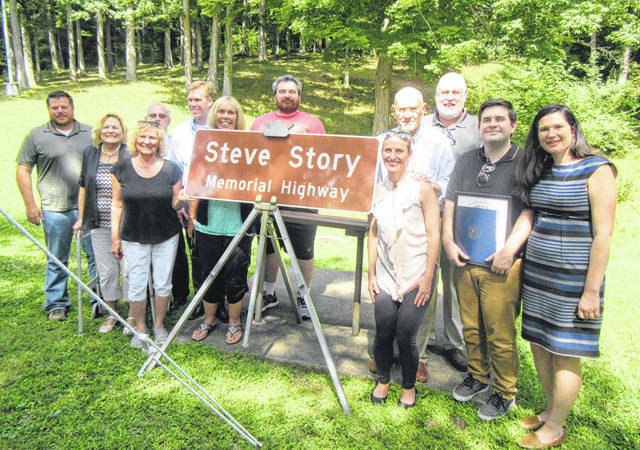 https://www.mydailytribune.com/wp-content/uploads/sites/42/2018/08/web1_8.5-Story-4-1.jpgThe signs for the Steve Story Memorial Highway were to be placed along U.S. 33 following the ceremony on Friday.